Having been raised on a farm and educated at a great institution, I became hooked on irrigation in the Middle East where I spent 3 enjoyable years exporting technology back to where it all started from thousands of years before. The thrill of ‘making it work’ has stayed with me for 30+ years. There can’t be a better job – getting paid to play with water and plants, invent better ways, and help people achieve their goals. Experience allows me to take calculated risks on new challenges with new tools. I enjoy the practical application of useful tools like genetic algorithms, managed aquifer recharge, and web-based monitoring. But most of all I enjoy the people. I’m lucky to work with great clients, great staff and great colleagues – and then relax with great family and great friends. 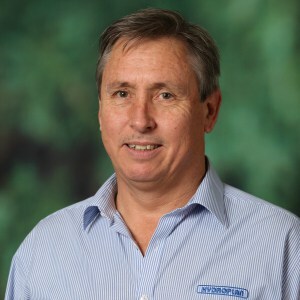 HydroPlan is one of the largest irrigation consultancy firms in the world, maintaining a consistent focus around irrigation design services for almost 30 years. Irrigation technology has changed enormously during that time, and HydroPlan has changed with it, leading our clients to new tools and methods, and always striving to give them better value from their money, water, power and labor. We operate where our clients want us to. Whilst this is mostly in Australia, we operate throughout Asian and MENA countries, and we have had a presence in China since 2003. In Africa for example we’ve designed systems covering hundreds of thousands of hectares. From offices in Perth, Adelaide and Sydney our twenty plus staff operate throughout urban and regional Australia, drawing on their diverse backgrounds from around the world. Our clients come to us for many different reasons – but mostly because water is important to their business. We help them capture, treat, store, recover, pump, distribute and monitor their water. Most of the distribution systems are pressure systems (eg pop-ups, drip and pivots) but we also design gravity systems (eg channels, border check), and of course the pumps, pipes and controls needed to tie them together. We’ve designed thousands of systems, and whilst most of these are small they must work just as reliably using the same technology as the largest.